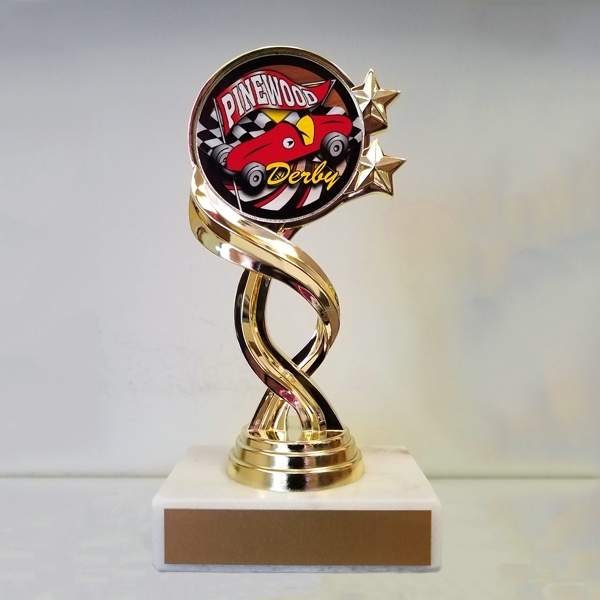 Bright Gold Twisted Sport series trophy with a fun and colorful Pinewood Derby theme 2" mylar insert. White genuine marble base. 6" tall. 40 characters of lettering included; $0.10 per character after first 40. Additional lettering may be charged separately after checkout. Billboard and Superstar series resins have a bronze colored finish and unique styling. Available in two sizes. Intricately detailed resin sculptures in a lustrous bronze color finish. 7 1/2" tall. Designed to mimic the color and texture of cast bronze, these resin awards are the perfect choice for outstanding players, coaches, students, teachers, team moms, or anyone worthy of special recognition. Can hang on a wall or stand using included hardware. 40 characters of lettering included per trophy; $0.10 per character after first 40. Additional lettering may be charged separately after checkout.